Dream it ~ Wish it ~ & ~ Do it! Hi guys, today it's all about my daily casual easy to go out outfit! I love just throwing some shirts and pants on and rock the day! ( all about comfy ). Here I have two of my top favorites, they are biker's jacket from Zara ( like seriously who doesn't love to invest in a nice biker jacket!) and textured crisscross boots from CharlesandKeith. One thing about this biker jacket apart from the obvious fashion statement in itself is for me it totally makes casual layering very simple and easy; like I can totally layers some skirts or pants and have it over and look all effortless! (I have always been a fan of layering my outfits and honestly half of my closet is pretty much with oversized jackets and shirts and etc etc..). So basically one of my go-to winter jackets have been this one ever since I got it! Well, keeping the outfit basic here I've paired a basic high waisted jean with an irregular frilled top (rather than going with just plain basic Tee I decided to make it a little interesting.). Hope you guys enjoyed this outfit ensemble. 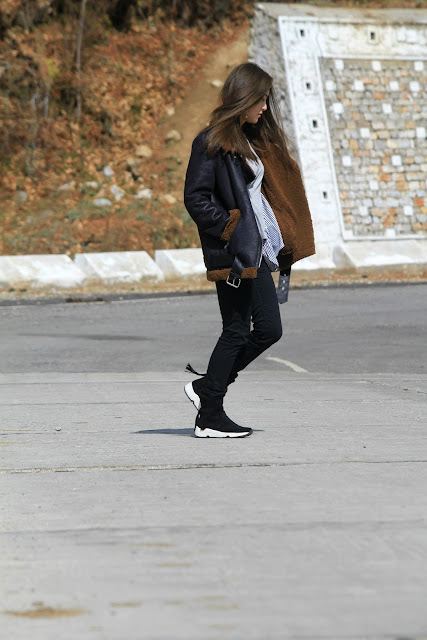 Thanks for dropping by and scroll down the pictures to see the outfit details. Have a great day and slay your own style! xoxo! Never doubt yourself just 'cuz someone said so! always believe in yourself. Cheers! Your irregular frilled top and black high-waisted jeans look great styled together. You look fabulous rocking your OOTD!